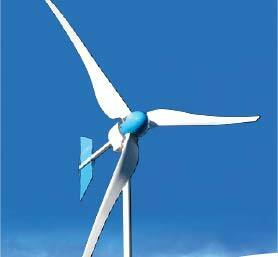 A wind turbine is a machine for converting the kinetic energy in wind into mechanical energy. If the mechanical energy is used directly by machinery, such as a pump or grinding stones, the machine is usually called a windmill. 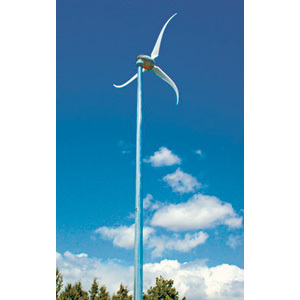 If the mechanical energy is then converted to electricity, the machine is called a wind generator. Kestrel e230i (800W) The e230i is a distinctive 3 blade turbine that has a low start up torque, increasing its efficiency. The axial flux permanent magnet brushless alternator is powered by an optimised three blade rotor, with patented pitch control. The e230i maintains rated output in excess wind speeds, optimising the potential power output and energy yield. Kestrel e160 (600W) The e160i is compact and virtually silent as it generates energy. 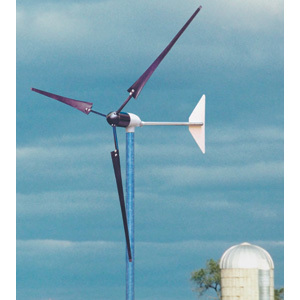 Rotation speed is controlled by rotor turbulence, which accounts for the 6 blade design and its quiet efficiency that can save fuel costs and replaces noisy generators. The e160i is installed around the world powering public lighting, railway switching and radio towers as well as educating children. 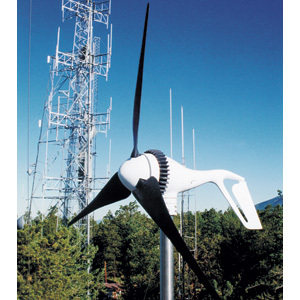 Kestrel e400i (3kW) The new e400i is the next level in small wind turbines. By optimising renewable power output and performance, the efficiency of the e400i makes it a valuable asset for fulfilling energy requirements. Modern living requires a massive amount of energy that is depleting fossil fuels. The e400i generates regulated and optimised energy for increased energy efficiency that is adaptable to all installation requirements.